Consumer demand for mobile coupons is on the rise because they offer a better experience than paper coupons, and they’re much more convenient. When we surveyed 1,204 U.S. consumers for our 2018 Mobile Coupon Survey, nearly half of them said they prefer mobile coupons to paper. Mobile coupons also create a sense of urgency, helping retailers to drive short-term spikes in revenue, and presenting marketers with new opportunities to collect data, track usage, and laser target the right customers. But how do you build successful mobile coupon promotions? Here are five tips for you based on our survey data. 1. Offer, and deliver, mobile coupons via text messages. It’s no surprise that people prefer to receive coupons on their mobile phones and that they want the convenience of being able to redeem the coupon directly from their phone. Fifty seven percent of respondents prefer to receive the mobile coupon in a text message so that it’s accessible via a link. Sixty percent of respondents said that they would redeem a coupon delivered via text message within one week; 25% within three days. 2. 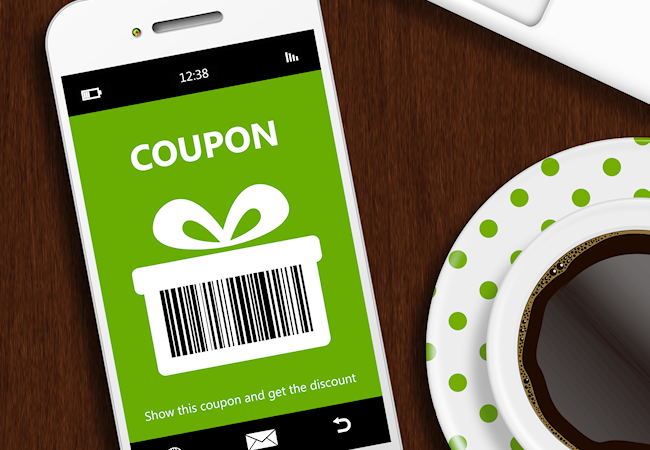 Use mobile coupon promotions as an incentive to grow your SMS subscriber list. Welcome coupons are a great way to drive new business, but they can also be very effective as incentives to encourage customers to grow SMS subscriber lists and build membership for your mobile loyalty program. More than two-thirds of consumers we surveyed told us that they are more likely to join a list when an instant coupon is on offer. Time and time again we’ve seen the effectiveness of on-demand coupons. More than three quarters of people we asked said they were likely or very likely to redeem mobile coupons that they requested. Combined with the fact that 60% of consumers told us that they are likely to redeem a coupon they receive via text message within one week, on-demand coupons can be a powerful tactic for retailers and have proved to be a great traffic driver. 4. Advertise mobile coupons in store. In today’s digital world, it comes as a surprise that in-store signage still rules when it comes to mobile coupon promotions – with 57% of research respondents saying that they are most likely to respond to a coupon promoted via in-store signage versus out-of-store advertising. This is good news for retailers that offer in-store marketing programs to suppliers, and helpful insights for suppliers looking to offer coupons to drive purchases and build marketing lists. 5. Employ high-value, single-use coupons. Consumers overwhelmingly prefer higher-value coupons that they can use only once, versus lower-value coupons that they can use multiple times. The important thing here is for the retailer to accurately track coupon requests and usage to ensure that the customer receives the same single-use coupon regardless of the channel used to request the coupon. That mobile coupon must also expire upon use across all channels, so that customers can’t use it more than once. For a more detailed look at what U.S. consumers really want from mobile coupons, you can read the complete 2018 Mobile Coupon Survey.